Finding out about Reed from current students will give you great information and a deeper insight into our community. Students at Reed play a critical role in the work of the admission office. They greet and talk with visitors in the lobby, lead campus tours, conduct admission interviews, and share meals with prospective students. Students also participate in other aspects of college operations, from maintaining trails in the Reed canyon and answering calls at the help desk in the technology center to meeting and interviewing candidates for faculty and staff positions. Reed students are a resource you can trust. Connect with our students by sending an email; indicate in the subject line either the name of the student you would like to correspond with or the nature of your inquiry. Reedies are standing by and would love to hear from you! Favorite aspect of student life: Reedies Taking Care of Reedies. Everywhere I go, I'm looking out for other folks and I know that they are looking out for me. Ask me about Night Owls! What you would tell a prospie about Reed: Being a Reedie means being part of a schoolwide community that asks a lot of you and gives even more back. If you can find a class, club, or cause to engage with, pour your heart and soul into it. You won't be disappointed! Best thing about Portland: The Columbia Gorge. It's about an hour out of Portland and it's the most beautiful place I've ever been. Favorite aspect of student life: I love studying in the Canyon! It's such a lovely place to sit, study, and relax! What you would tell a prospie about Reed: Be an advocate for yourself personally and academically! Self care is important! Best thing about Portland: Soccer! Portland takes its soccer seriously, and I love checking out Timbers games! Favorite aspect of student life: A lot of people complain about stress culture, but it's all just a big game we play. Yes, we do indeed get stressed, but you know everyone here has your back and is more than willing to help you through a tough time and stand with you in solidarity when you forget why G-coupled protein receptors are important. (Hint - They pretty much do almost everything). What you would tell a prospie about Reed: Reedies care, and we're not afraid to show it, and speak out about the things that speak to us. This is why we protest decisions made by administration and decisions made by our student body, and do so in a way that is respectful to the parties involved. This is not a place to come if you want to be surrounded by people that share your ideas and opinions; this is the place to come if you want to grow and figure out the why behind your own beliefs. Best thing about Portland: I was talking to one of the commons chefs about this question (he's a native Portlander) and we came to the conclusion that much like Reed, Portland is so great because it's a place where everyone is accepted. Academic interests: Election sciences, cold war, international relations. Favorite aspect of student life: The open discussion and intellectual curiosity that occurs between Reed students in Commons after class. What you would tell a prospie about Reed: Reed is a place not only where people are curious about the world and eager to learn about it, but also have the courage and openness to have their ideas challenged. Reedies always want to learn more about the world, not just from their professors and classes but from staff members, alums, and each other. Favorite aspect of student life: The community building. Every activity I have been a part of at Reed has had such a welcoming community that reminds me why I love Reed. People here genuinely care about each other (even if they don't outwardly show it), and being put in a common situation with other people at Reed has allowed me to develop amazing relationships I didn't think I would make anywhere else. At Reed, being thrown together with 20 strangers doesn't just have to be stressful, it's also an invitation to form bonds. What you would tell a prospie about Reed: Reed is probably going to be nothing like you expected, and that's okay! It's such a unique place that none of my preconceived notions of what is was going to be like could possibly apply. You are going to find yourself in a strange, strange place, but one that is a welcoming home for so many students. Best thing about Portland: Tilikum Crossing. Tilikum bridge is this gorgeous cable-stayed bridge that runs across the Willamette river, and it's so relaxing to walk across, people watch, and enjoy the water. Favorite aspect of student life: Student autonomy! If a club doesn't exist, create it and people will join! Students are actively encouraged to take a part in establishing and improving Reed's community. Also, the canyon cats! What you would tell a prospie about Reed: Reed is about so much more than academics. I came to this school expecting to be pushed hard in my classes, but I've also been encouraged to grow and try new things at Reed. There are so many different organizations to get involved in and become passionate about: try a weird PE! go on a hike! learn calligraphy! Reed is full of possibilities. Best thing about Portland: The trees! Favorite aspect of student life: I love the theater department. I've been involved in a number of department productions even though it's not my major. Theater and a number of the other fine arts at Reed are made accessible to all students, and the theater productions are often exciting and very fun to attend. What you would tell a prospie about Reed: It's difficult in a good way. And because Reed is a small school with a lot of resources it can often be easy to get money to pursue your passions. Grants, fellowships, and student body funds are just a few examples of the ways to find resources for any number of activities, ideas, or projects. Best thing about Portland: We've got great food. Also the weather is really wonderful in the early fall and late spring. Favorite aspect of student life: The students work so hard to make campus a better place for all of us -- like starting critical discussions about community issues, exercising great autonomy over Reed government and judicial system, and making excellent events and lectures happen. 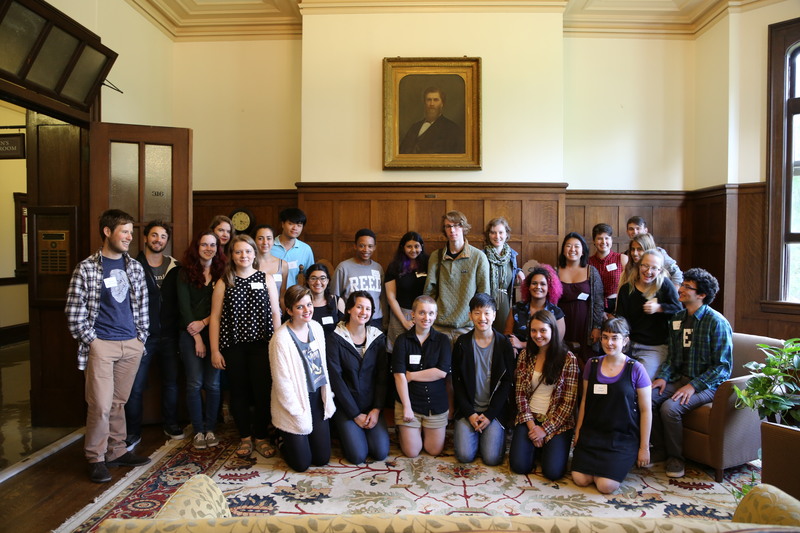 What you would tell a prospie about Reed: Reed College is a wacky place that has so many different ways for you to express your own wackiness. Within all of this, lies some of the smartest people you will ever meet. Best thing about Portland: The beauty of the Pacific Northwest is so accessible from the city.